Directions: Head northeast along I-75 business spur. Parking is available directly off State Street at the American Legion Park or the Wawatam Park Lighthouse just past the Mackinac Grille/Star Line Railroad Dock. Additional parking is available at multiple sites along the boardwalk all the way to the St. Ignace Marina. The Huron Boardwalk, which covers the majority of the downtown St. Ignace area, offers great views of the open waterfront. 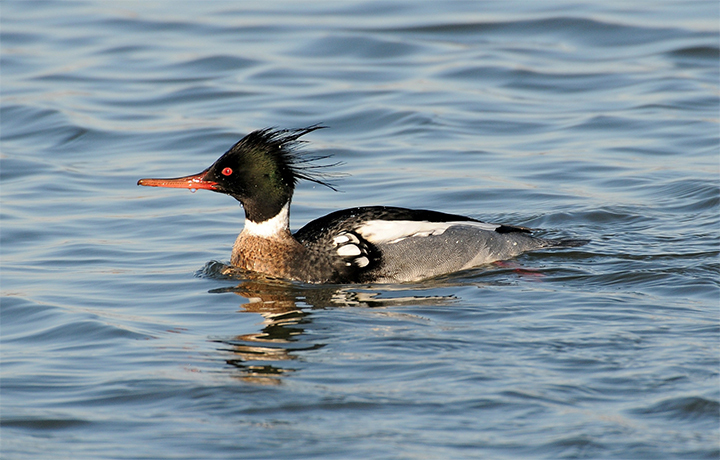 In most seasons one can find Common and Red-breasted Mergansers along with other diving duck species out in the bay. During spring/fall migration large numbers of Swallows are often seen feeding over the bay. Occasionally, you may find migrant Warblers along the shrubs near the boardwalk. Overall, the boardwalk provides a pleasant place to stroll while looking for boards. Make sure to check out the numerous gift shops, restaurant, and museums along the waterfront as you look for birds. The Huron Boardwalk takes you through the heart of downtown and features many historical plaques along the way. In addition, adjacent to the boardwalk are numerous gift shops, museums, and restaurants to enjoy.